This page will tell the story behind the first of the unfortified castles in Ireland, the beautiful Renaissance manor house of the Ormond Castle at Carrick on Suir, County Tipperary, Ireland- which was built by Thomas Butler, the 10th Earl of Ormond, in the hope that one day his cousin, close friend, and possibly lover Queen Elizabeth I would come to visit Ireland and stay here. Thomas was born 1531 or 1532. He carried the nickname 'Black Tom' (Tom Dubh) referring to a battle he fought for the crown defeating a man referred to as 'White Tom'. Castles in Ireland- The Ormond Castle at Carrick on Suir. Black Tom was educated at court in London on the wishes of his father, James Butler. The Butlers of Ormond, bearing the title of chief cup bearers to the king, had always been close to the Crown. In London, Thomas was part of a small, elite group of children of noble families who had the privilege to be educated alongside Prince Edward. There was a lot of coming and going in the group, but Thomas Butler remained part of it between 1544 and 1552. It was during this time that he met and formed a friendship with his cousin Elizabeth. 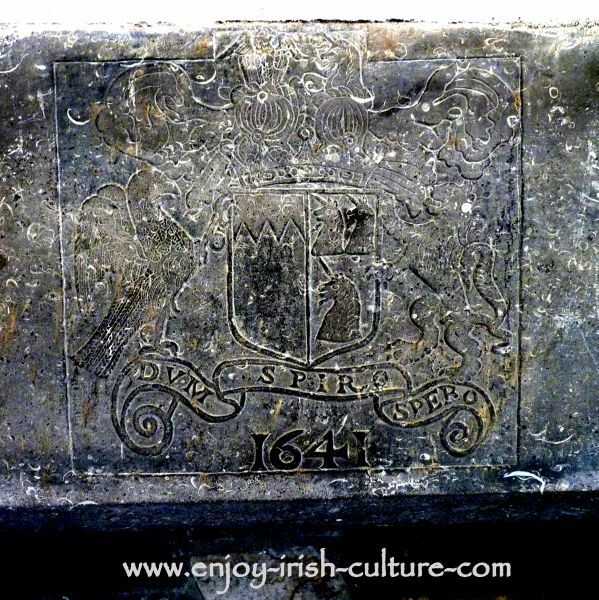 The Butler family crest carved into a fireplace at the Ormond Castle- the first of the unfortified castles in Ireland. Elizabeth, born in 1533 was a year or two younger than Thomas. Her father, Henry VIII had had her mother, Anne Boleyn, executed when Elizabeth was not even 3 years old, and Elizabeth declared illegitimate in an attempt to deprive her of her succession rights. He kept Elizabeth in his household however, where she grew up alongside her younger brother Edward who was seen as the successor to the crown. One can only imagine what this experience of early childhood trauma and daily humiliation must have been like for her. Elizabeth benefitted from some the best private tuition available though, and perhaps fled into this world for want of a safe place. Early on she learned to write both in English and Latin, to speak fluent Flemish, Italian, Spanish and French. Later on she added fluent Cornish, Welsh, Irish and Scottish to the list. 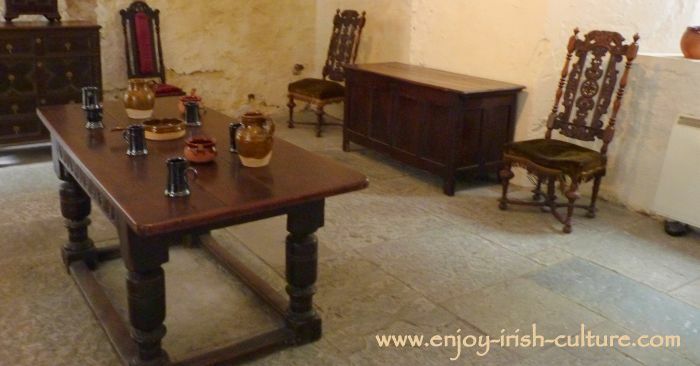 Renaissance furniture at the first of the unfortified castles in Ireland. Thomas was not treated well at court either. He was looked down upon and perhaps treated with suspicion by some of the youths because he was Irish. Not quite belonging, but appreciating the widening horizons of Renaissance education, the Elizabeth and Thomas would have had a lot in common. Thomas received education in languages, design, architecture and astronomy among other subjects. She was Protestant, and he became the first of his influential family to convert to Protestantism. A friendship developed between the two youths that was going to last for life. In 1547 Henry VIII died and Elizabeth’s half-brother Edward VI became king. This was the start of many difficult years for Elizabeth who was now fourteen. When her step-mother got married to John Seymour who then became part of the household, she was physically and sexually abused by him. Of course, there was no such concept as sexual abuse at the time and at one point Elizabeth was interrogated in an attempt to make out she was a willing participant in this ‘affair’ in order to overthrow the queen. Her only way out was to deny that anything had happened at all. Some historians believe that it was this core experience that stopped Elizabeth short from ever becoming married. After Edward’s death in 1553, a five year power struggle for the crown began which at one point saw Elizabeth arrested for a year under suspicion of having supported Protestant rebels. Thomas continued to spend a lot of time in London. During his education there, he had formed many connections with people who had now progressed into important roles at court and government. He was said to have spent an extraordinary amount of time around Elizabeth, so much so that their relationship gave rise to rumours. She often sought his counsel and appreciated his opinion. In 1554, there were reports of Elizabeth being pregnant. In May of 1554 she was offered access to physicians, but refused, ‘committing her body to God’. If she indeed had a child, could this have been Thomas’? In 1558 Elizabeth finally became Queen at the age of 25. She never married although there were several suitors and infatuations over the years. One imagines that with her outstanding education and traumatic life experience from a young age she would have been only too aware that marriage would most likely impede on the freedom she had being single. In 1565, Thomas had a Renaissance manor house built at Carrick on Suir in County Tipperary, Ireland, which is said he built with nobody else but Elizabeth in mind. He had invited her to Ireland, and she promised to come. He wanted to impress her with appropriate lodgings for her stay. 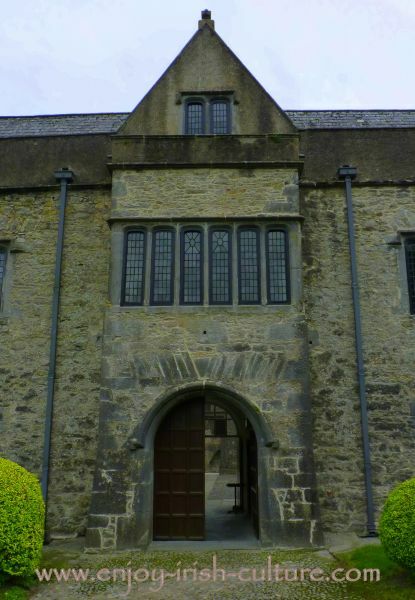 The Ormond manor house was the first of the unfortified castles in Ireland, marking the transition in mind set and architecture from medieval to Renaissance thinking. The choices Thomas made at Carrick were pioneering. To put his house in context, only a handful of unfortified mansions were ever built before Cromwell came to Ireland in 1649, with the real boom starting only at the end of the 17th century. Thomas was some one hundred years ahead of everyone else in Ireland in his design approach. 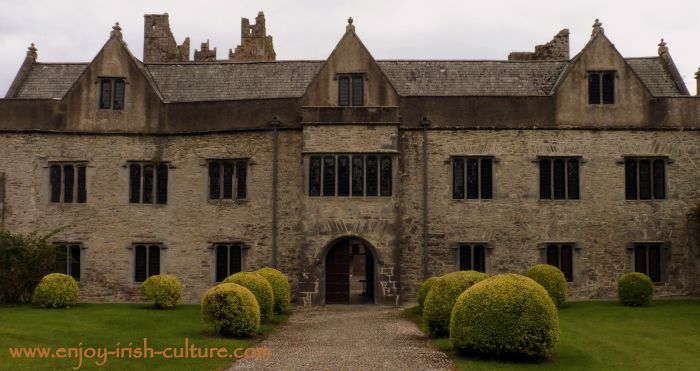 Irish culture was still looking to the medieval fortified castle, compare Parke's Castle, built in the 1630ies. In the Renaissance manor, there was large window space, expensive red brick chimneys, a bright and airy feel throughout, and a large 'long gallery' on the first floor which during the Renaissance replaced the great hall as the central room of the residence. The manor house is built in Elizabethan style architecture which features both Dutch and Italian influence. Both can be seen at Carrick with Dutch-inspired gables, and Italian-inspired stucco work. One might say that the design and construction of this palace was an hommage to Elizabeth, now queen of England. Castles in Ireland- the Ormond Castle at Carrick on Suir in Tipperary, Ireland. Sadly, with the pressures of government and conflict elsewhere distracting her, Elizabeth never did make it to Ireland in her 44 years as queen. Thomas got married three times and fathered four children in those marriages. Only one, his daughter Elizabeth, survived into her fifties, the others died young. He also fathered 12 illegitimate children, and perhaps more that we don’t know about. He continued to spend a lot of time in England. In 1588 the queen made him a ‘Knight of the Garter’. Being made a member of this exclusive order was a huge privilege. Thomas is said to have worn the blue ribbon of the order around his neck every night in bed. Thomas rose to important positions in Ireland in the service of the Crown. He quashed the Desmond rebellion of 1583 as military governor of Munster putting an end to multi-generational conflict between the Ormond and Desmond families. In 1588 he was instrumental in the defeat of the Spanish Armada and in 1597 he became Lieutenant General of Ireland. Thomas, who died in 1614, outlived Elizabeth by eleven years. It is said that he wore the ribbon of the Order of the Garter around his neck when he died. In his will he favoured one of his many illegitimate children, Piers FitzThomas Butler of Duisk, which gave reason to rumours that Piers may indeed have been born to Elizabeth, the ‘Virgin queen’ who referred to Thomas as her ‘black husband’. The Ormond Castle is run by the Office of Public Works. Find visitor information and a review here. 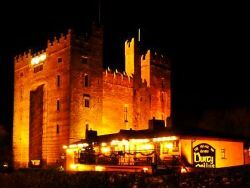 Hi there, we hope you enjoyed our article on the story behind the Ormond Castle, the first of the unfortified castles in Ireland. We'd really appreciate you using the social functions provided here to tell the world about our website so that others can enjoy it, too! You will find the social functions at the top left, and below this paragraph further down the page. Thanks so much!